Discover the various traditional African music instruments of the Horn of Africa's Ethiopia including the kerero, krar, washint, masenqo and begena. Ethiopian instruments have been used for centuries to accentuate different aspects of the mental, physical, and spiritual realms. While some instruments conjure religious interpretations, others find sanctuary in recreation. Find out what makes this Horn of Africa vibe so unique, and experience the sounds and ceremonies of Ethiopia’s most revered instruments below. The Kebero, a cylindrical dual sided wooden drum, beats in a spiritual context with metaphorical meaning. Played in Ethiopian Orthodox Tewahedo Church ceremonies as a means of celebration, the Kebero is said to represent various aspects of Jesus. A Krar is a five or six stringed instrument classified in the Lyre family. 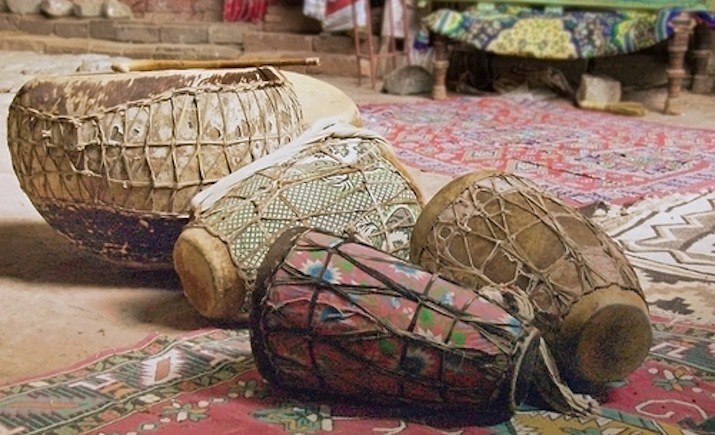 This instrument has been used in Ethiopia for centuries, often associated with love songs. Horse hair, rawhide and wood. These three things predominately make the beautiful one stringed lute that is the Masenqo. Tuned with the protruding wooden peg at the top, this instrument is played with a bow much like a cello or violin. Its simple construction lends for smooth harmony with the powerful Amharic voice. Used in conjunction with meditation and prayer, the Begena is a sacred instrument, used mostly in the confines of ones personal space. Although occasionally used in certain festivities, the strong tones of this ten stringed lyre are usually heard in solitude, mostly being played alongside no other instrument other than the voice. The Washint is a wooden, bamboo, or cane made flute whose construction greatly depends upon its player. The placement of finger-wholes vary from performer to performer, leaving its sound and style malleable. The pitch of the instrument depends upon its size, some yielding lower tones while others resonate at higher, more trebled frequencies. Washint players are said to perform with multiple flutes, using each one to complement the pitch of a particular song.